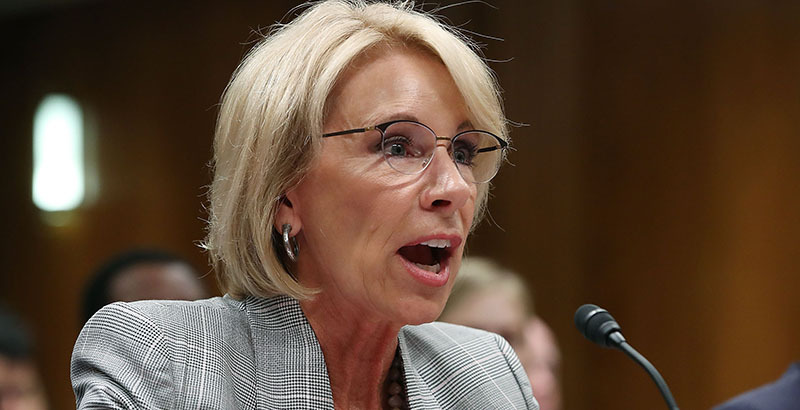 Just one day before the college admissions bribery scandal broke, the U.S. Department of Education released its proposed 2020 budget. What little attention the budget got in much of the media was focused on its proposals related to school safety, choice or higher education. But a provision that could bring more autonomy to schools in how they serve their most vulnerable students has been largely overlooked — $50 million in incentive grants for districts to decentralize their federal dollars to schools. Now that the budget hearings are starting, this proposal deserves some legitimate attention. At issue is whether school leaders and staff can have a say in how federal resources are used in their buildings for their students. Under the status quo, the heavy red tape attached to federal dollars presumes a top-down approach to spending decisions in which district leaders make all the programming and staffing decisions for schools. The district decides if the federal funds should be used to buy a reading specialist or a social worker or smaller classes or tutoring, and so on. This process virtually erases school leaders from playing a role in decisions on how best to use the federal money in their buildings. Surely principals and teachers tend to know a lot about what will or won’t help their students succeed. Yet those in schools are simply on the receiving end of these decisions. The budget proposed by Education Secretary Betsy DeVos would reverse that through a pilot program for up to 10 decentralized districts that would send federal dollars directly to schools, putting principals and teachers in the driver’s seat on how to spend those dollars. While the research is far from definitive, there is good reason to believe that a more decentralized model of autonomous schools could work better than what we have now. In fact, some two dozen larger districts have already been devolving their state and local funds to schools, letting them design budgets that work better for their students. Districts in Boston, New York City, Chicago, Denver, San Francisco, Nashville, Houston, Indianapolis and other cities have shifted decisions about how best to spend their state and local dollars down to schools to increase equity and flexibility and, ultimately, to do more for students with the money at hand. But in every one of these districts, federal money is still kept separate and managed centrally. That’s the way it’s worked for decades, despite reams of evaluations pointing to disappointing results of federal grants, including the single-largest federal aid program for public schools: the $16 billion Title I program. What’s that called again? Doing the same thing over and over and expecting a different result? For a time, it seemed the Every Student Succeeds Act might begin to change that centralized grip on federal funds. The 2015 law authorized a pilot program for up to 50 districts per year to be freed of some federal rules, letting them fold federal dollars into their decentralized allocations to schools. The Education Department was to then study the pilot to learn from it. But the pilot was a bust. To date, just one district, Puerto Rico, has been approved. In an October meeting Edunomics Lab held with financial leaders from many decentralized districts, we heard that the federal rules were so deeply ingrained in their districts and state agencies that undoing them is no small feat. The original pilot came with no transition funding, yet there would be costs related to the switch. And so, the status quo prevails. The top-down financial structure inspired by decades of federal rules remains intact, regardless of whether it makes sense for students. That’s where DeVos’s proposed $50 million budget item comes in. If funded, it would provide districts with a modest allocation to take part in the federal pilot that gives schools more flexibility to use their federal money in ways that make the most sense for their students. The proposed financial incentives would help defray the cost of dismantling the compliance infrastructure, rethinking the state audit process and training principals on the opportunity with federal funding. It’s a smart idea, and one that could help crack the code of how larger districts can realize more value from their limited dollars. In fact, strong results in several decentralized districts, like those in Chicago and Denver, suggest the idea is worthy of more study. But we can’t investigate whether decentralizing federal funds can work unless more districts sign up for the pilot. Granted, $50 million is tiny in the scope of a $74 billion federal education budget. But it offers a shot at uncovering new finance structures that have the potential to make federal programs like Title I deliver. These programs are designed to help our country’s most vulnerable students. It makes sense that school leaders, who presumably know their students best, have the chance to weigh in on how the money gets used to best help those students. We can’t know for sure what the outcome will be, since we haven’t yet tried decentralizing federal dollars. But if we don’t try it, we’ll miss the chance to potentially uncover a better way to deploy federal dollars and help some of our neediest students. That would be money well spent toward fulfilling the promise of federal aid to schools and children. Marguerite Roza, Ph.D., is director of the Edunomics Lab and a research associate professor at Georgetown University.